At the Individualized Education Program meeting, educators and family members work together to determine a way forward for a student with a reading disability. As discussed in the first post of this series, preparing for an Individualized Education Program (IEP) team meeting, including completing the Family Questionnaire for Individualized Education Program, is a valuable way for families to advocate for a student with a disability. This second installment outlines the key elements to include when developing a child’s IEP, or written educational plan, following an initial evaluation or three-year reevaluation for special education services. The Individuals with Disabilities Education Act (IDEA, 2004) mandates that all students with disabilities have the opportunity to access a free and appropriate public education (FAPE) focused on “special education and related services designed to meet their unique needs and prepare them for further education, employment, and independent living.” For example, IDEA would ensure that a student with a reading comprehension disability receives an evidence-based intervention for improving the student’s comprehension skills, even if no one else in the student’s English or reading class needed that intervention. In addition, IDEA would require that the teacher delivering the intervention had the proper training. The group of knowledgeable individuals forming the student’s IEP team determine what that intervention will be, who will deliver it, when and where it will be delivered during the school day, and for how long. It is important to remember that the “I” in IEP stands for “individualized.” That is, the IEP should be tailored to meet the unique needs of the student. For a student with reading disabilities, an IEP may include not only reading interventions as a supplement to the general education curriculum, but also accommodations (e.g., extended time to read assignments), modifications (e.g., lowering the reading level of the text on a science test), and assistive technology (e.g., a digital reading tool that allows the student to apply comprehension strategies) to help the student be successful in general education classes. Regardless of the state in which you live, IDEA (2004) requires all IEP forms to include similar information. The following sections provide a brief description of the criteria relevant to designing an IEP for a student with a reading disability. The IEP should clearly state why the student needs specially designed instruction to be successful in the general education classroom. This explanation includes current and relevant data to illustrate the student’s strengths, weaknesses, and needs in the area of reading (see the example IEP form within this post below). The information is used to determine the annual goal(s), progress monitoring procedures, and services. After establishing the annual goal, the IEP team needs to identify the progress monitoring tool to measure the goal. The team also may describe any procedures for using the tool, such as how frequently the data will be collected or how adequate progress will be determined. Returning to the example IEP, progress for the fictional student Matt will be measured every 10 instructional days with a particular comprehension assessment. The expected rate of improvement, 1.1% increase in accuracy per week, was obtained from the information provided by the test publisher and was used to determine Matt’s performance criterion when writing his goal. To ensure Matt maintains steady progress toward that goal, the data collected every 2 weeks will be plotted on a graph that contains the goal line connecting Matt’s current performance to the criterion (shown in blue on the example graph in Figure 1 below). The procedures described in the example IEP indicate that if Matt has four consecutive progress monitoring scores fall above or below the goal line, a change will be made to the instruction or the goal. 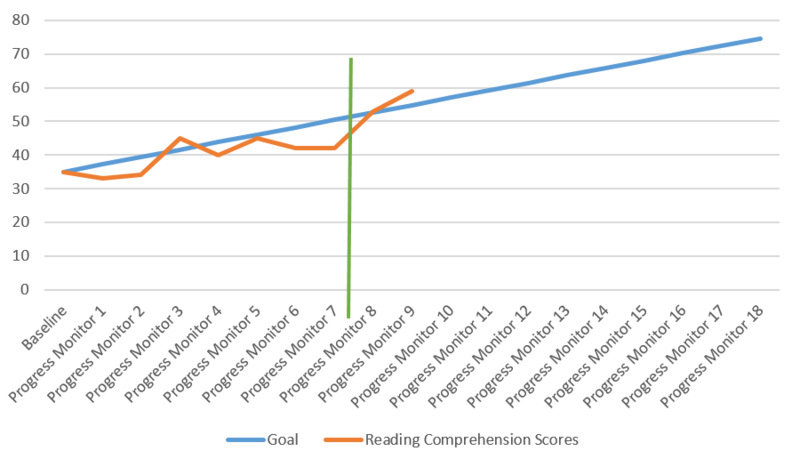 For example, the orange line on the example graph shows that Matt’s progress monitoring scores were mostly below the goal. After four consecutive scores (Progress Monitor 4 through 7) remained below the goal, a change was made in the comprehension strategies Matt was being taught. This is noted on the graph with the insertion of the vertical green line. Matt’s scores began to improve after this change. What the IEP team identifies should be done differently to meet a student’s unique reading needs is called Specially Designed Instruction. This will include a supplemental reading intervention delivered in a small group or individually (either in the special or general education classroom) that can help the student make progress toward his or her annual goal. The example IEP form describes how the fictional third grader Matt will receive instruction in “understanding new vocabulary words in context and using graphic organizers to record important details from a passage and show how those details are related to the main idea.” The instruction targets the particular comprehension skills that were listed as weaknesses in his present level of performance. When Matt did not make adequate progress over four consecutive progress monitoring administrations, the instruction may have been changed to focus on one area at a time (e.g., vocabulary in context, recording important details, or relating the details to the main idea), use a new or different strategy (e.g., changing the graphic organizer, adding a strategy for generating a main idea statement), or increase the opportunities to practice. Specially designed instruction often is coupled with supports such as accommodations that make it possible for a student with a reading disability to be successful with the general education curriculum. While Matt is improving his ability to comprehend grade-level texts, he still needs to learn science and social studies content as well as experience the complex literary texts that his classmates are reading. If he receives the accommodations listed on the example IEP form, Matt can continue to learn content and not fall further behind his peers. Understanding the sections of the IEP can help all members of the team, including families, develop a quality plan to support a student’s needs. As discussed here, the IEP sections are intertwined. For example, the annual goal must be based on the student’s present levels of performance, and the expected rate of improvement is based on the progress monitoring measure. The instruction is designed to achieve the goal by addressing weaknesses in present levels of performance, and that instruction is changed based on progress monitoring data. Like all IEP team members, all parts of the plan must be synchronized toward the common goal. Matt completed a Student Interest Survey regarding his academic strengths, preferences, and interests. Matt stated that he likes to jump on the trampoline, hike, and practice tennis. Matt feels happiest when he is playing with his friends and twin sister, Ana. Matt’s favorite school subject is science. Reading is his least favorite subject. Matt identified math and science as strengths. He said, “I always earn better grades than my sister in math and science!” Next year, he wants to get better at reading, writing sentences, and following directions. Matt recognizes that school is hard and understands that he learns best when he sits near the teacher and asks questions when he experiences uncertainty. Matt’s parents completed the Family Questionnaire for Individualized Education Program regarding their child’s education. Matt’s parents believe his strengths are work ethic, kindness, and math. However, they understand that he has difficulties with reading. He experiences difficulties pronouncing unfamiliar words and understanding the meaning of a story. Matt’s parents are concerned that his reading difficulties will cause him to struggle in other academic areas like math and writing. They stated that Matt has become discouraged, aggravated, and unenthusiastic about school. This has caused concern for his behavior as he is becoming unmotivated to succeed at school. Their academic goals for Matt are for him to strengthen his reading skills and have a positive attitude for learning in school. At home, Matt colors, plays educational computer games, and completes a monthly reading list with his sister. His parents try to read him a story before bed. Lastly, Matt’s parents noted that he takes 10 milligrams of a dextroamphetamine and amphetamine combination daily for his attention-deficit/hyperactivity disorder. Matt’s basic phonic skills (i.e., blending, segmenting, manipulating consonant-vowel-consonant words) are strong, scoring at the 80th percentile on a standardized measure of word identification. On his classroom assignments, Matt is able to identify the characters and settings of stories and use appropriate oral vocabulary. Despite Matt’s strengths, he also demonstrates weaknesses in reading. He scored at the 14th percentile on the most recent state reading assessment and at the 23rd percentile on a standardized measure of written vocabulary knowledge. Matt’s difficulties in reading affect his ability to be successful in the general education classroom because he does not understand grade-level text without assistance and has difficulty with grade-level literacy standards such as determining how key details support the main idea of a text. On the most recent class test, Matt answered 35% of the reading comprehension questions correctly. Therefore, Matt needs specially designed instruction in the area of reading to receive full access to the general education curriculum. By March 2020, when reading a grade-level reading passage, Matt will answer comprehension questions with 70% accuracy on three out of four data collections. Progress monitoring will be implemented once every 10 instructional days with a commercial comprehension assessment containing a grade-level reading passage and 20 comprehension questions. The annual goal (70% accuracy on comprehension questions) was calculated using a growth rate of 1.1% improvement per instructional week (commercial assessment expected rate of growth for Grades 3 and 4). Instruction will be changed (e.g., lessen/increase services, increase/decrease content, use different supports) or the goal raised/lowered if four consecutive data points fall above or below the goal line. In a small group or individual setting, the special education teacher will provide 30 minutes per day of specially designed instruction in the area of reading. Instruction will include vocabulary development and reading comprehension. The following skills will be targeted: understanding new vocabulary words in context, and using graphic organizers to record important details from a passage and show how those details are related to the main idea. Matt also will have the opportunity to review concepts and skills with which he is struggling. e) An adult will read aloud all assessments and directions except for when reading aloud an assignment or assessment for reading comprehension. Note: The information provided in this IEP example form is based on the academic experiences of a fictional third-grade student with a reading disability named Matt Encinas. Information related to parent concerns is generated from the Family Questionnaire for Individualized Education Program form the first post in this series. Individuals With Disabilities Education Act of 2004, Pub. L. No. 108–446, 20 U.S.C. § 1400 et seq. (2004).